Regardless of whether you're a seasoned industry veteran or an emerging designer, the final 36 hour before any runway show is the most stressful time, where anything that can come loose or fall apart usually does and nerves are highly strung. Renowned fashion documentary maker Loïc Prigent chronicled the backstage joy and madness of crucial seasonal runway shows featuring the creations of some of the leading designers in the fashion world. ACMI has selected 2 of Prigent's documentaries for the Melbourne Spring Fashion Week (MSFW) to move the fashion firmament of Lionel's Melbourne beyond the 80s and 90s, City Square, Exhibitions, Emerging Designers, the Business Series and the 4 Faces of MSFW and on an intimate journey into the backstage of the global fashion world. Curator James Nolan selected to air 'The Day Before: Isabel Marant and Lanvin' giving viewers a full access story of the backstage, the ateliers, the designer in studio, the fittings, the stress and the dramas occurring during the 48 hours prior to the runway show going live for 2 different designers. Charismatic Isabel Marant who runs a family-centric fashion house, focuses on dressing real girls and not fantasies or chauffeur-driven women. Her company is one of the only self-financed French labels to enjoy success with its chic and generational clothes since 1994. She tried to appear relax while battling the stress of getting her runway show together. Lanvin's fashion show, led by maestro Alber Elbaz, is a creative marathon characterised by indecisiveness on a quest for presenting a perfect runway show that raises the levels of the applause meter. Alber is credited for putting Lanvin back on the international fashion scene. Why? know what really happens behind the scenes of runway shows 48 hours before they go live. 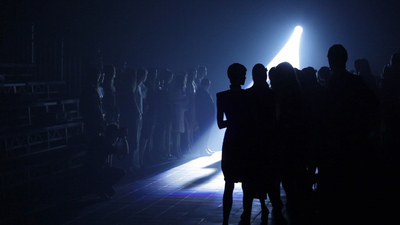 Where: know what really happens behind the scenes of runway shows 48 hours before they go live.